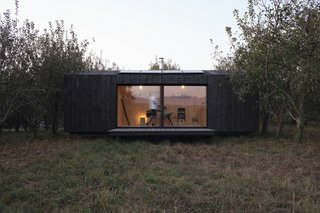 Heva is a prefab self sufficient cabin. It's a space experience, opened to the landscape and awareness of our daily needs. A micro-architecture that combines modern comfort and traditional materials. Prefabricated in our workshop, transportable by road and autonomous to varying degrees. It draws from nature its elements, the sun, the water and the wood of which it is entirely constituted. Heva's drawing is based on a balance of proportions, masses and energies. The contrast between light and dark, inside and outside. Heva was designed by the architect office A6A (Bordeaux) and is manufactured by My Little Loft (Ste Foy la Grande). Heva is a reflections on the off-site assembly. Its innovative construction system in wood frame is patented by My Little Loft. The wood species are local and of controlled origins. The structure is form pine plywood, it is insulated by wood fiber. Wood cladding boards are burned to protect them from insects and weather. These deep black is reminiscent of regional lumberjacks' cabins. Its prefabricated and artisanal production at the same time, allows a quality of construction which combines exigency of the details and respect of the deadlines. Heva goes and carries himself. Exit of the workshop it is brought to destination by flatbed truck and installed thanks to a crane. It touches the earth subtly, with as little impact as possible, leaving the land reversible to use. Its dimensions adapt to the road jigs. Elements can connect to each other to form larger sets. The reception area and transport must be carefully studied and validated before installation. Heva opens the field of possibilities, catalyzes the place and the moment. Heva offers autonomy at different scales depending on the site of implantation and use. Heating, lighting, washing, everyday needs that we forget the hidden complexity. The heating is provided by a wood stove, the electricity is generated by photovoltaic panels, the water is fully filtered with a micro wastewater treatment integrated into the volume. The shower and faucets have only low flow rates. The toilets are managed in a dry way, without waste and pollution of water. Heva does not hinder the earth, it is delicately placed on it and does not need connections. A6A uploaded heva through Add A Home. While modern in style, Heva channels the beauty of nature. The lower level serves as a dining area or workspace, while a loft provides a cozy sleeping nook. This sleeping area includes a bookshelf and sconce. A spacious deck and large glass doors allow for seamless indoor/outdoor living. A view into the sleeping nook. Light pine finishes make the interiors feel airy and spacious. A simple, yet elegant vanity doubles as storage. The idea of balance is expressed in all facets of the project—from light to dark, indoor to outdoor. A glimpse of Heva's interior and deck.